Roadmap API not enabled. To fix, enable the API or ask your Roadmap account owner to do it. Basecamp user is not a Roadmap user. Imported Basecamp users default to resources in Roadmap, meaning they can be assigned to tasks, but cannot log into Roadmap. To fix, migrate the person to Roadmap user status. Extension is not connected to Roadmap. Expand the extension configuration panel. If you do not see the green "Let's get to work" button, you need to authenticate the extension with your Roadmap account. Go here and select which browser you're using. Extension automatically updated to newest version and the page needs to be refreshed. Once any page containing to-dos is refreshed, the icons should be visible for the remainder of your sessions. This appears to be limited to Safari. Antivirus software flagged or quarantined a file during installation or subsequent update. Some antivirus software does not distinguish between "white hat" extension developers and "black hat" extension developers (i.e. hackers). To fix, "train" your antivirus software to not flag Roadmap extensions. Alternatively, disable the antivirus software, install / update the extension, and reenabled the antivirus software. Extension domain is blocked or "blacklisted". Roadmap uses an extension framework from crossrider.com. Be sure crossrider.com is whitelisted. Wrong Basecamp account or user login! Many people have access to multiple Basecamp accounts, or they have multiple logins to the same Basecamp account. 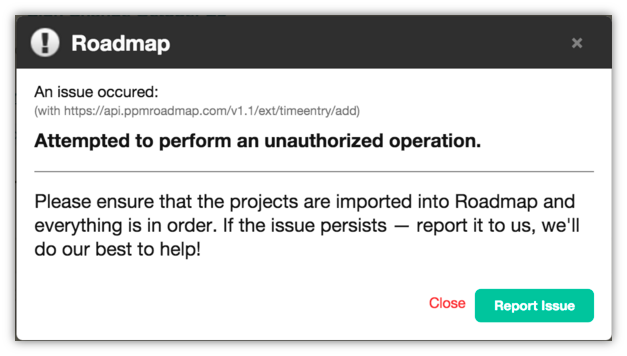 If clicking this displays pop-up error message (like below) your Roadmap user privileges are set to read-only, or set to read-only for just this project. To fix, contact your Roadmap account owner or admin about obtaining higher privileges. If you see this either the project has never been synced with Roadmap, or it was connected at one time, but has since been disconnected. Go here to see how to connect Roadmap-only projects with Basecamp. Pop-up blocker is preventing the configuration panel from displaying. Disable the blocker, configure the browser extension, then re-enable the blocker. Just remember to disable the next time you need to adjust your settings!